Happy 20th Birthday Shawn Mendes! 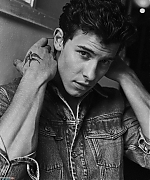 Today is our favorite, Shawn Mendes‘ 20th birthday! On behalf of Shawn Mendes Live! and all Shawn fans we wanted to wish you a happy birthday! It’s been amazing following you with this site for the past years! I’m so proud of everything you have accomplished. I can’t wait for the rest of the year and next! I’ll always be supporting you. I hope you have an amazing day, spending it with all your family and friends. Have a great day! In celebration of Shawn’s birthday, I have added ultra high quality outtakes from Shawn’s photoshoot for Wonderland earlier this year. Make sure to take a look at them in the gallery and wish Shawn a happy birthday: @shawnmendes! Today is Shawn Mendes’ 18th birthday! On behalf of Shawn Mendes Live! and all Shawn fans around the world, we wanted to wish you a very very happy birthday! We are all wishing you a year of happiness, success, joy, health, and love. Have an amazing day Shawn!